Plumbers 113 Hudson St N. Y. Those who remember the Nixon era will be familiar with the name John Mitchell, "Plumber." 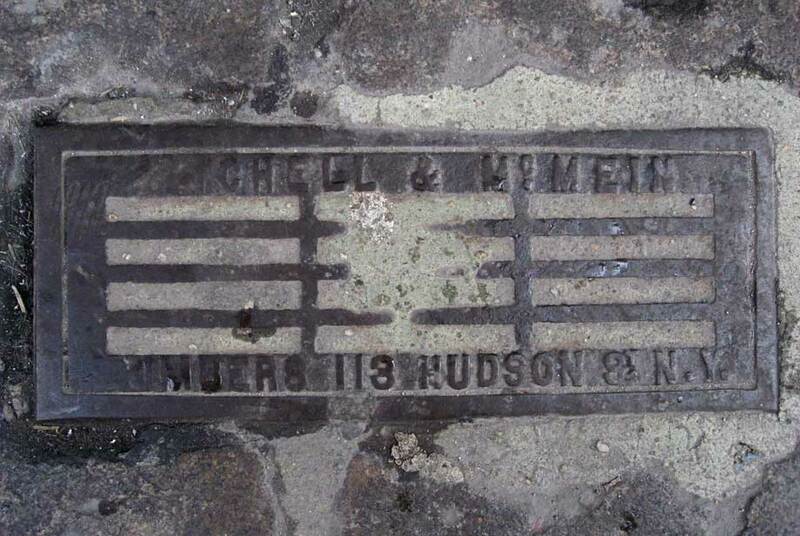 The John Mitchell who left his name on this bit of sidewalk plumbing, however, dates from an earlier time. This John Mitchell was a native New Yorker, probably born around 1840. His birth date is uncertain. His entry in the 1900 U. S. Census says he was 50 years old and was born April 1850. However, several other sources contradict this date. The 1880 census says he was 37 years old (1843), the 1910 census says he was 70 (1840), the 1920 census says he was 78 (1842), and his obituary says he died in Feb. 1931 age 90 (1840). Probably, then, he was born in New York City in the early 1840s. His obituary notice in the New York Times, 24 Feb. 1931, p. 21, makes much of his service in the Civil War: "Major John Mitchell, who served during the entire Civil War as a private in the 170th New York Volunteers, died at the age of 90 on Sunday at his home at 64 East 127th Street. Mr. Mitchell was a retired plumbing contractor but until two weeks ago visited his former place of business daily. He had been active in Democratic politics. During the Civil War he was captured by Confederates and officially reported dead, but escaped and returned to his regiment. After the war he was brevetted a Major by President Johnson." Civil War records for George R. McMein show that he enlisted in the New York 20th Light Artillery Battery on 10 Mar. 1863, was promoted to full corporal on 10 Mar. 1865, and was mustered out on 31 July 1865 at New York City. His record in the 1900 U. S. census gives his age as 56, born October, 1843, in New York. He died around 1904/05, and his widow, Sarah, is found in the U. S. Census of 1910 living on Webster Ave., Jersey City, New Jersey, with her step-son, George R. McMein, Jr., age 40. In the 1880 census McMein, a widower, lived at the same 270 Webster Ave., Jersey City, with 3 children, and his sister and her 2 children. Mitchell and McMein were partners in the plumbing business for nearly forty years (approx. 1868 to 1904/05). They were located at 113-115 Hudson St. from 1874 to 1905. Mitchell continued at 170 West Broadway and later 180 West Broadway from 1905 until his death in 1931.